front door and beyond the screens? We’re spending less than five percent of our time outside these days2. WHY does it matter that we’re obsessed with the tiny screen in our pockets? Has anyone checked in on the status of the mental health crisis in America recently? Technology is addictive and can cause lasting effects on one’s mental health, including increasing your chances of experiencing extreme fatigue, stress, and depression3. Get this – the brains of the internet- obsessed resemble those of drug and alcohol addicts4. Our lives have become centered around devices, and the moment you grab your phone because you thought you heard a buzz – you’ve lost control. We need to reclaim our relationship with technology, and we know a way: nature. Not only is nature free, but time outdoors is proven to boost your mood, creativity and productivity5, while also reducing stress and symptoms of anxiety or depression6. How can nature help us escape the control that technology has taken over us? The reality is that technology isn’t going anywhere, and just like many other objects or behaviors that are “bad” for us – we need to set boundaries. We need to tell technology to take a hike. It’s easier than you might think… literally just go outside! National Take A Hike Day is coming up on Saturday, November 17, and is a great chance this Fall to organize a fun outdoor adventure with your friends - join the #TechAHike movement that day by going offline and outside to reap the full benefits of unplugging in nature. Pledge: Commit to going offline + outside on Nov. 17, rally a group of friends, and find a trail near or far for your outdoor adventure. Post: Download the #TechAHike away message by visiting www.techahike.com, then post the away message to your preferred social media account. 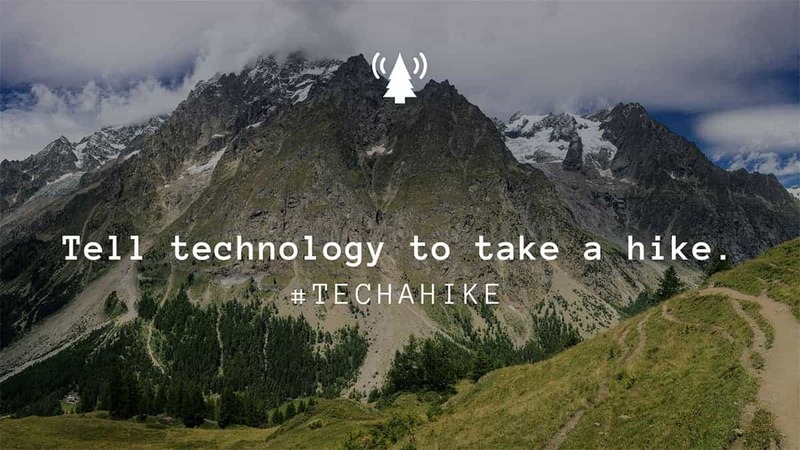 Make sure to tag @tech.a.hike and @americanhiking, as well as tag two of your friends to challenge them to #TechAHike with you! Put On Your Boots! Ready–Set–GO offline and outside for at least ONE hour on Nov. 17th! Enjoy at least 60 unplugged minutes to explore the Great Outdoors and celebrate the natural beauty of our world. The #TechAHike challenge is working to raise awareness of the mental health importance of both unplugging from devices and the recharging power of nature – with this initial launch, help us get as many people offline and outside for National Take A Hike Day on Nov. 17!